Info:Ulf Christiansson: vocals, guitar | Dan Gansmoe: drums | Bertil Sörensson: vocals, bass | Dan Tibell: keyboards | All songs by Ulf Christiansson, except for "Days Passing By" ("Dagarna går") by Dan Tibell. Swedish version released in 1978 on Prim Records. English version released in 1980 on Lamb & Lion Records (The Benson Company, Nashville), US and on Word Records, UK. Recorded at Supreme Studio, Stockholm, Sweden. 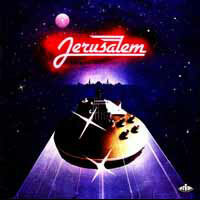 The first record was simply “Jerusalem” in Swedish (English version titled “Volume 1″) and it was released by Prim records/Stockholm: Musicians at that time were Dan Gansmoe drums, who later that year was replaced by Klas Anderhell. Bertil Sorensson on bass, who also later was replaced by Anders Mossberg. Anders at that time was playing guitar in a band called ” Vatten” but changed instrument to bass and has basically played that ever since). Dan Tibell keyboards and Ulf Christiansson vocals, guitar.